Compiled by: Mr. Biman Baruah from Sivasagar, Assam. Lord! I am dying for your glimpse, without your blessing I cannot achieve anything. I urge you to preserve by honor. I am a beggar standing at your door, when will you look at me? Rafi Saheb was eternally peerless in the above classic devotional song with full of mode, emotion and devotion for God from the film Baiju Bawra (1952) composed by Naushad Ali picturised on tragic hero Bharat Bhushan. The Bhajan or Devotional song has a unique place in Indian society and they are simple songs sung in the praise of God.Â Most of Bhajans were written between the 14th through 17th centuries. Bhajan is an important part of a Hindu revivalist movement which swept through India during the Mogul period; this movement was known as the Bhakti movement. Indian classical music based on ragas and tala played on Veena, Sarangi Venu, Mridanga, Dholak or Tabla used in Bhajans. Filmi Bhajans are devotional songs from Hindi movies, which are composed using the melody like a popular filmi song. Basically, Bhajans relate to Hinduism, however many of the devotional songs are general and acceptable to followers of other religion or faith also. The devotional songs from Vijay Bhatt’s BAIJU BAWRA picturised on Bharat Bhushan, “O Duniya Ke Rakhwale” & “Man Tarpat Hari Darshan Ko Aaj” established Rafi Saheb’s credentials as the number one playback singer of Hindi Cinema which also began a first trend of creating star with Bharat Bhushan on the magic of his golden voice and the actor had got his stardom which was his 18th film. The newly established Radio Programme “Binaca Geetmala” played the two songs regularly which also lead to wide popularity of the songs. Another devotional Rafi gem, “Duniya Na Bhaye Mohe Ab Tu Bulale Tere Charnoo Main” from Raja Nawathe’s romantic melodrama BASANT BAHAR was also picturised on Bharat Bhushan. In both the films, Bharat Bhushan played the role of a struggling musician having faith for God and the voice of Rafi Sahab was emotionally peerless for his devotion to God. The song from B.R. Chopra’s golden jubilee hit social drama NAYA DAUR, “Anna Hai Tu Aa, Rah Main Kush Pher Nahin Hai, Bhagwan Ghar Dher Hai Aandher Nahin Hai” depicts that there is no barrier for any devotee to enter the Lord’s home. This hunting devotional number by Rafi Saheb was picturised on a least known artist in a temple with full gathering of stars like Dilip Kumar, Vyjayantimala, Ajit & others. The song “Insaf Ka Mandir Hai, Bhagwan Ghar Hai” from Mehboob Khan’s AMAR was picturised on thespian Dilip Kumar. Other devotional Rafi number “Sukh Ke Sab Saathi, Dukh Main Na Koyee” from A. Bhimsingh’s GOPI was also beautifully picturised on Dilip Kumar and the song depicts the reality of our life that everyone is very near to a person in the time of prosperity, but wants to avoid him in his bad times. The song “Mujhe Apni Sharan Mein Le Lo Ram” from TULSIDAS was so soulful and a total surrender in devotion of God. The duet by Rafi-Lata, “Brindaban Ka Krishan Kanhaiya” from AVM’s MISS MARY was very popular, picturised on Om Prakash & Meena Kumari. The duet “Jai Raghunandan” by Rafi,Asha Bhosle & Chorus from S.S.Vasan’s GHARANA was picturised on a devoted family of Lalita Pawar, Raaj Kumar, Rajendra Kumar, Devika, & Shobha Khote. The song from Kidar Sharma’s CHITRALEKHA, “Man Re Tu Kahe Na Dheer Dhare” was picturised on Pradeep Kumar which depicts the ultimate reality of human being. Another popular duet by Rafi-Lata from A. Bhimsingh’s KHANDAN, “Badi Der Bhai Nandlala” was picturised on Sunil Dutt & Nutan Behl. 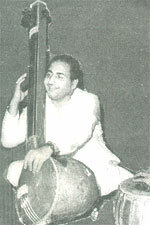 Music Director Ravi won the Filmfare Best Music Director Award for the film Gharana (1961) and Khandan (1965). The song from Khalid Akhtar’s NAYA RAASTA “Ishwar Allah Tere Naam, Sara Jag Teri Santan” picturised on Balraj Sahani describing the several names of God, he is the creator of whole world and only he can bless all of us. The title song from Virendra Singha’s GANGA TERA PANI AMRIT describing the importance of River GANGA and its HOLY water in Indian History, Religion, Faith and Life. The song was played in background at the beginning of the film and also at last beautifully picturised on Navin Nischol with a large group in Tractors on the river bank. In addition to the songs mentioned in the above list, Rafi Saheb lent his peerless voice for several devotional songs of Hindi Film Music. The notable devotional song from the film Dus Lakh, composed by Ravi was beautifully picturised on character artiest Om Prakash. In K. Shankar’s SACHAAI, hero Shammi Kapoor pray God to excuse him for his past crime & dishonesty in the voice of Rafi Sahab visiting Church, Masjid & Temple with full devotion and the song was “Mera Gunaah Maaf Kar Mera Zameer Saaf Kar, Mere Jeesu, Mere Khuda, Mere Parmatma”. Another devotional one from Krishna Shah’s SHALIMAR, “Naag Devta” is the last song by Rafi Saheb for zany actor Shammi Kapoor. The song was composed by R.D. Burman in the lyrics of Anand Bakshi. The devotional songs, “Sai Baba Bolo” and “Sainath Tere Hazaaron Haath” from the Ashok V. Bhushan’s SHIRDI KE SAI BABA, written by Manoj Kumar and composed by Pandurang Dikshit were become very popular in the golden voice of Rafi Saheb. The role of Sai Baba was played by character artist Sudhir Dalvi in the film. In fact, Rafi Saheb was a great devotee of SAI BABA in real life. In the same year, another devotional Rafi number from the musical hit, AMAR AKBAR ANTHONY, “Shirdiwale Sai Baba, Aaya Hai Tere Daar Pe Savari” was also become very popular and with perfect lip-synchronization by Rishi Kapoor. The Rafi-Asha duet “Hai Naam Re Sabse Bada Tera Naam O Sheronwali Onchee Sheronwali” from SUHAAG picturised on Amitabh & Rekha playing “DANDIA” in a temple premises is being still heard in all corners of the country during festive seasons like Navarati, Durga Puja, Kali Puja, etc. The popular number of this category in early 1980s, from J.Om Prakash’s AASHA, “Tune Mujhe Bulaaya Sheronwalien, Main Aaya Main Aaya Sheronwalien” by Rafi, Narendra Chanchal & Chorus was well picturised on Jeetendra & Rameshwari in the steps Amarnath Mandir. The song was truthfully composed by Laxmikant-Pyarelal in the well-meaning lyrics of Anand Bakshi. The standout devotional Sufi song, “Har Jalwa Tera Jalwa” from HARJAEE came all the way in late 1981 after impetuous demise of Rafi Saheb and it was picturised on Randhir Kapoor, the senior son of Raj Kapoor. The last song of this category by our beloved Rafi Saheb is “Makhmal Ho Ya Taat Ka Parda” from the film SOORMA BHUPALI (1988), written, edited & directed by comedian JAGDEEP and the song was picturised on Danny Denzongpa who had experience of singing with Rafi Saheb as a proficient singer. 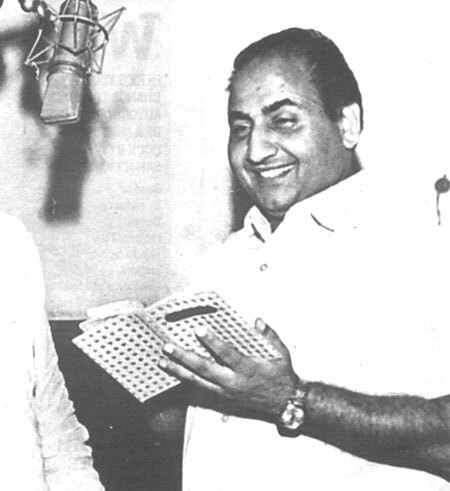 Rafi Saheb had also sung some memorable devotional songs for a non-film album composed by musician Khaiyyaam which was Rafi Saheb’s one of the earliest non-film albums. According to Khayyam, “Rafi had a desire to sing some bhajans -Hindu devotional songs; In fact, Rafi himself gave me some bhajan tunes and asked me to compose music taking those tunes as a base”. “Ai Maalik Tere Bande Ham” from V. Shantaram’sÂ DO AANKHEN BARAH HAATH (1957) composed by Vasant Desai and lyric by Bharat Vyas is a landmarkÂ devotional song of HFM sung by Melody Queen Lata Mangeshkar. “Main Tu Aarti Utaru Re Santoshi Maa Ki ” from Jai Santoshi Maa and “Satyam Shivam Sundram” from Raj Kapoor’s SATYAM SHIVAM SUNDARAM are another notable devotional song sung by Lata. “Tan Maan Dhan Saab Hai Tera Bin Tere Kiya Hai Mera” from MANCHALI sung by Mukesh which was well picturised on versatile actor Sanjeev Kumar. “Durga Hai Meri Maa Ambee Hai Meri Maa” from KRANTI sung by Mahendra Kapoor was picturised on Manoj Kumar. “Hai Khuda Har Fasla Tera Mujhe Manzoor Hai” from ABDULLAH sung by Kishore Kumar was picturised on Sanjay Khan. “Maa Sherowali O Maa Sherowali” sung by Shabbir Kumar from MARD was picturised on Amithab Bachchan. Music to human ears is heavenly and if it is purely devotional in the melodies voice of Mohammed Rafi it is truly divine. Nothing can be more deeply rooted in the Indian tradition than Bhajans or Devotional songs which are simple songs in soulful language expressing the many-splendored emotions of Love for GOD. In the above devotional songs, Rafi Saheb made a complete self-surrender to GOD through his singing and even though the songs mentioned being decadent, some of the songs can be heard again and again for indefinitely. This entry was posted on Sunday, August 9th, 2009 at 5:06 pm	and is filed under Meri Awaaz Suno. You can follow any responses to this entry through the RSS 2.0 feed. You can leave a response, or trackback from your own site. Post 11 by Mr. K Srinivas is a good post and appears to contain facts. Not to belittle lata mangeshkar, one of the great singing female legends of bollywood, but if one reads recent incident of lata vs rafi on royality issue, such incidents cannot be seem to be denied, especially when lata was at her peak in yester years. In the name of defending Rafi, he is spreading false, vicious and cowardly rumours. If a person wishes to accuse Lata, Asha, Usha (or anybody else for that matter) of committing an act of violence as the one quoted here, (s)he needs to produce solid and authentic evidence, instead of inventing hypotheses, fudging facts and maliciously spreading them around as the truth. Till date, there is no such evidence anywhere. Also now consider this: Vani Jairam had recorded the songs of the Hindi film Meera and even the Malayalam film Thomasleeha in 1976 in Bombay. If she had been a victim of this sort of violence, would she have dared to return to Bombay? It seems that K Srinivas is speaking a half truth when he use uses weasel-words like “it was udnerstood that….”. Understood by whom? Is there anybody except him who understand this? K Srinivas also says that Lata was scared of Vani Jairam (he is perhaps referring to the fact that the latter won the Tansen award for which Lata was also a contestant). Now, right in 1969, Lata had won the Padmabhushan from the Indian government at the young age of 40. Moreover, it is widely known that she had taken the decision in 1970 to stop accepting any more Filmfare awards. Any person with even a rudimentary understanding of the Hindi film world will realize that awards like the Padmabhushan and the Filmfare awards were far more prestigious than the Miyan Tansen award. It is also widely known that Lata and Asha weren’t the only female awardees of the Tansen Samman – in previous years, other singers like Suman Kalyanpur too were given this honour. In light of all this, it is highly unlikely that there was anything for Lata or Asha to feel scared about Vani. This statement is yet again full of holes and self-contradictions. During the reign of Lata and Asha, it is so well known that Geeta Dutt (nee Roy), Suman Kalyanpur, Suraiya and Shamshad Begum were all successful singers. So now what does this prove? mohdammed rafi sahab kya chale gaye mera to bahoot bhari nuksaan hua. mere geet,gazals,yaa shayeri aadi sbhi rachnayen aanath ho gai, mujhe iska bahoot zayeda afsos hai ki meri jan kari main rafi sahab tab aaye jab woh is jahan se guzar gai. unke jaane ke do saal baad mera unke geeton se parichay hua. kyonki tabhi humare ghar t.v ayaya. usse pehle pata hota to kya main april1980 ko unse na mil leti jab woh dalli rajhjhara aaye thi concert ke liye. mere papa to mile hi na,main nahin thi tab.out of station thi. meri badnseebi ki kahani tabhi se shuru thi mujhe pata hi nahin tha. unka aakhri deedar bhi na kar saki. maine unhen pehli baar t.v main hi deekha aur unki meethiaur makhmali,jaduubhari kya aawaz suni tabh se unki diwwani ho gai. main unki puri shakhshiyaat se pyar hai. main unse na mil pai iska afsos mujhe saari zindgi rahega. mat pucho unki kalpana kartehue ,unki yaad main main keetni hi rachnayen leekh dali. aur ab mujhe aisa lagta hai ki jeetna prem main unse kiya shayed hi kisi se kiya ho. main ek sher misaal ki taur par pesh karti hun. kya hi khubsoorat muhobat ke zamane hote. These days of austerity in addition to relative anxiety about incurring debt, many individuals balk contrary to the idea of having a credit card to make acquisition of merchandise as well as pay for a vacation, preferring, instead to rely on a tried plus trusted procedure for making settlement – hard cash. However, if you have the cash there to make the purchase 100 %, then, paradoxically, this is the best time for you to use the credit cards for several factors. I want to see this movie or the scene of this song, the song is with me,but I want to see with scene, if any one help me in this I will be thankful to him. I am 80 years old and wants to see with scene this song. Jayega Jab Yahase Kuchh Bhi Na Pas Hoga”Moti Mahal (1952) sung by M.Rafi & Madhubala Zaveri. I am searching for the song “suno suno ye duniya walo” sung by Md. Rafi. Please guide where I can download this song from. I will be eagerly waiting for your reply. MOHDRAFI WAS THE GREAT AND LEGEND SINGER SINGER OF OUR GREAT INDIA.HIS SIT WILL BE ALWAYS BLANK. Rafi had equal number of Non-Filmi Bhajans such as “Main Gwalo Rakhwaro Maiya, Makhan nahi Churayo..”, “Ab AAyee Gawanwa ki..”, “Paon paroon tore shyam..Brij me Laut chalo..” to name a few..He is the only singer in India who did not require any instrument for adding any ‘feel’.. His voice was enough in itself to express any sentiment..
we are from the Rafi Foundation, Hyderabad Chapter and your joining us would be greatly appreciated. A good overview of Rafi saab’s devotional songs! However all these are in relation to “bhagwan”. Rafi saab has clearly sung several devotional songs towards “allah” that are soaked in devotion and are equally emotional. I am not a muslim, but just listening to these songs makes you realise that bhagwan and allah are the same. Just a couple for example: 1. Har ek shay se aaala, har ek shay se afzal, har ek shay se badhkar madine ki galiyan. I believe the music is by SJ! 2. Another one is ” agar kamli wale ki rehmat na hoti, toh kismet ke maronka kya haal hota”. Hats off to rafi sahib! To add to this endless list of marvels in Rafi sahab’s voice, there are a lot of punjabi devotional songs that Rafi sahab sang in memorable punjabi movies like “Nanak Naam Jahaj hai”, a national award winner for its music, and “Dukh Bhanjan Tera Naam”. Leading in this list is “Mitter pyaare nu, haal mureedaa da kehna..”. This song is based on a poem written by Guru Gobind Singhji. The music director S Mohinder beautifully set up this poem in shastriya sangeet based tune for super hit movie Nanak Naam Jahaj hai. Rafi sahab lent his voice. and the gem came into existence. On every Guru Nanak day, and Guru Gobind Singh day, this song is played in all Gurudwaras, worldwide. Rafisahib gave us the ultimate gems of music.No music can be thought of without him. I shall be extremely happy to have all no film songs sung by the masterio. Interesting message on the divine playback singers. Rafi Saaheb will be remembered as the best singer of all time and he has the monopoly of having sung the maximum best heart-touching devotional songs from hindi films. 5) Bhakti samay main tript ramay to samay ka kisko gyan, din kat jaaye palo ke samaan…..
and hundreds of such golden voice songs which straight away toches your heart. I think he was bless GOD to sing such a melodious songs. Do you agree with me. I am looking for Great Rafiji sung song “suno suno aye duniya walo Bapuji ki amar kahani”. I will be glad if anyone can arrange it. Nice article on devotional rafi. I am not able to stop putting my pen here after reading the nice article here. Though I am a born telugu man, I have spent most of my life from my childhood to current middle old age in orissa and grew listening to the great songs of the great rafi saab. It will be a surprise to note that despite my birth status, my knowledge of telugu films and songs is minimum and due to my environment I am much attached to the great rafi saab and his songs. When this article on devotional rafi was being read by me, I could think of the only great rafi who could render beautifully the hindu devotional songs, indeed bringing out the true potential of a really great singer and accomplished legend of bollywood. How beautifully rafi ji sings those devotional songs from baiju bawra and others. These numbers have given a turning point to the hindi film world in those days. I specifically wanted to share one experience. In 1975 rafi ji had visited orissa on account of some programme related to Haj Pilgrimage and on that ocassion there was a concert conducted there in which rafi ji sang live. And, believe me, it was a fortune for me to behold the great rafi singing live. He was a humble and simple man who came in a white ambassador and came to the concert in a Rickshaw being pulled by a rickshaw puller. Such a great singer was such a simple man. Such was this great legend from bollywood. He sang extempore the songs requested by many of the people present there. One such song (i could not clearly remember) was a devotional song on Lord Krishna, which rafi ji sang for 25 minutes continuously and the applause was beyond imagination. This point I wanted to pen in this devotional rafi column. Few would have seen rafi saab singing live and it was no exaggeration that his voice was as beautiful as was in the film songs. Not only hindi, he sang other language songs also, one song being a telugu number rendered by him ( I could not remember). On that ocassion, though not much associated with telugu pride, but as a telugu born man, I felt much proud on the great rafi’s remarks on telugu industry. Rafi ji said that he sang in many languages, but the most difficulty he ever faced was in singing a telugu song and he said that singing telugu song is really a very difficult job. Rafi remarked that telugu song rendition is extremely difficult. Of course, telugu people remark on telugu as the greatest and toughest language at the same time. And he further stated that before singing telugu song, he met ghantasala master of the telugu industry at his house and learnt few tips to render telugu numbers. Rafi stated (I remember even now) – I have met Ghantasala master saab, my friend & whom I consider as the greatest ever singer I have ever met and specially telugus are blessed with such incomparable singer in such great language (recd. with large applause by telugu people) . He further said that With the support of ghantasala saab, I could fulfil my dream of singing telugu songs (though rafi saab had sung very few telugu songs) This was really a great tribute paid by rafi to ghantasala (as he had passed away an year before) Both rafi and ghantasala were great friends. As a oriya resident, my knowlege on ghantasala was very limited and strictly speaking, i came to the know the importance of ghantasala only after great rafi ji’s statement on ghantasala, though I could earlier hear from many of the telugus counting ghantasala as another incomparable divine singer like mohd. rafi in indian playback singing. A very modest and humble, yet simple going man rafi ji was really great, as I saw him closely. Despite being such a great personality, his humbleness and gentle behaviour was beyond words. We were very fortunate to behold the greatest singer of bollywood, Shri Mohd rafi saab in 1975 in orissa. Singers like rafi saab can be counted only on fingers. On the other day I was reading a column in true voice forum here regarding lata’s tribute to rafi ji. In my view, this is a sheer overhyped belated selfish natured tribute. Lata’s role as political lady in film industry is well known. When vani jairam rendered beautifully bole re pappi for the film guddi, it was understood that the three sisters, lata, usha and asha went to her house and threw away all her belongings and asker her to vacate bombay in those days, fearing that vani jairam would overtake her. That is so called Bharat ratna lata mangeshkar’s history. If she is really a great singer, why this jealousy on others and lack of self confidence. In contrast, rafi ji never was such, otherwise mukesh, hemant, mahendra no body would have come up. Rafi ji was truly a great man as well as great singer. So the above tribute by lata on rafi, I feel is overhyped, though a great tribute was made by lata on rafi at least belatedly. But rafi saab is beyond such “things”. Hi – I’m not sure if it is appropriate to mention here some devotional songs of Rafi sahab which are related to Ramadan. I bought an audio cassette a long long time ago which I still play when Ramadan comes. And reading this article and your comments made me think of it and I thought I would share that. Some of the songs in it are “Suno Ramzaan ki dastaan to suno, rehmaton ka bayaan hai bayaan to suno”, another one on the story of “Ayoob” and another “Ya nabi salaam alaika” which makes me cry every time I hear it starting with the words “maalik-ul-mulk la shareeq ala hu, wahdaoo la ilaha illahu”. I don’t know if these songs are available in CD form or not, I have never enquired anywhere but they are definitely devotional songs of Rafi Sahab just as all of the ones mentioned above. Rafi Sahab’s voice is magical in them but that is usual for any of his songs. He was a true artist, a true devotee and a true child of god. The song that I mentioned are even today most played songs,as there are many more of rafi sahab on divotional side,, “”””so mention other singers but Rafi ji hold the prior position here””” ,but nice work by you,Yes to write about Rafiji its a challenge,,,,,how much we try but many pages of his greatness remains covered so no critisizm only appriciations !! ganga meri maa ka naam, baap ka naam himala(pictuerised on shammi kapoor) (film: tumse achha koun hai) could be added to the list of devotional songs sung by rafisaab. Thanks for ur Devotional songs collection. taki” was sung by Usha Mangeshkar. Great informative article. You included almost all the notable Bhajans sang by the maestro. Many congratulations. I have a Audio cassette taken out by Thomson with Rafi on one side Vanijayaram on the other. do any body have the MP3 version or CDs fo these songs. if the CD is available any where i would like to purchase the same. I have collection of forgotten RAFI’S 6 Bhakti Geet. Great article sir. Thank you. Indeed, the magic of Rafi Sahab can never be expressed in words, it can only be felt while listening to his divine singing. Needless to say, there is nobody close to him, be it in devotional songs or otherwise. Another bhajan I remember is perhaps non-filmi, Tere bharose O Nandlala, koi ro ro baat nihare, wonderfully rendition. Rafi Sahab had sung finest bhajans and devotional numbers, rafi’s devotional numbers suddenly come into picture, whenever we think of devotional songs, from HFM. “manmohan mann mein ho tumhi” from Kaise Kahoon can be added to the above mix. “Naag Devta” By RDB can’t be considered as a genuine devotional number IMO, however “Makahn chor nand kishore” from Takkar by the same composer can also be added. great article, just keep on the flame ignited in your heart and spread the light all over.